Arche Hotel Krakowska offers 1700 m2 located on the 1st floor for your use. 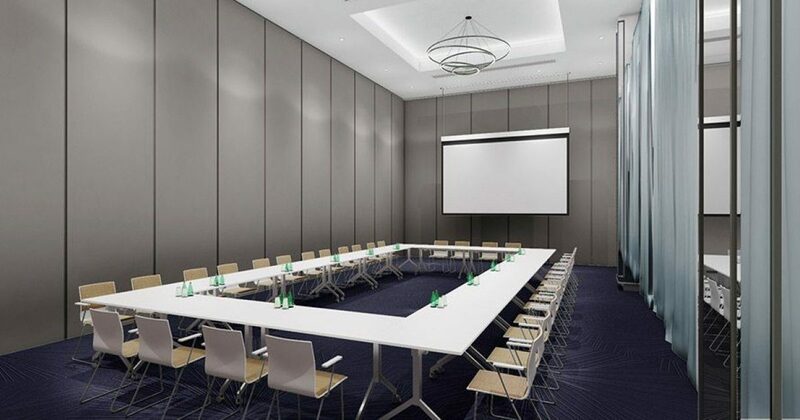 The largest room called Fuchsia with the area of 700 m2 can be divided into 6 smaller conference rooms equipped with multimedia equipment and very fast Wi-Fi connection. Looking for a place for gala, conference or trade fairs? We will connect the Fuchsia room with the Foyer and we will get the area of 1000 m2, perfect for organisation of larger ventures. Additional 9 small workshop rooms are a perfect conference supplementation with smaller trainings or are a great base for business meetings. Fuchsia room is divided into 6 smaller conference rooms: Fuchsia No. 1, Fuchsia No. 2, Fuchsia No. 3, Fuchsia No. 4, Fuchsia No. 5 and Fuchsia No. 6. The height of the Room 5.2 m and the large openable window for bringing in a car or large equipment facilitates the preparation of large events and creation of any kind of scenery, being base for, e.g. galas and concerts. Bright room with tall windows, naturally illuminated. The room has built-in multimedia overhead projectors, screens and sound system and possibility to program the upper illumination adequately to the performed event. Inner module of Fuchsia Room. The room has built-in multimedia overhead projectors, screens and sound system and possibility to program the upper illumination adequately to the performed event. Outer, corner module of Fuchsia Room. The room has built-in multimedia overhead projectors, screens and sound system and possibility to program the upper illumination adequately to the performed event. Outer, corner module of Fuchsia Room. The room has built-in multimedia projectors, screens and sounding and possibility to program the upper illumination adequately to the performed event. Small conference room, perfect for running workshops or smaller trainings. Room with tall windows, naturally illuminated. There is a possibility to increase the space with additional modules: Amethyst Room, Ruby Room and Sapphire Room. Small conference room, perfect for running workshops or smaller trainings. Room with tall windows, naturally illuminated. There is a possibility to increase the space with previous modules: Marengo Room and Amethyst Room and subsequent module: Sapphire Room. Conference room, perfect for organising workshops, trainings or smaller conferences. Possibility to cross to the adjacent Umbra Room through the transition with a door connecting both rooms creates a possibility to organise cosy parties with connection of gastronomic zone with the banquet zone. Room with tall windows, naturally illuminated. Small conference room, perfect for running workshops or smaller trainings. Possibility to go to the adjacent Lila Room through the transition with a door connecting both rooms creates a possibility to organise small parties with connection of gastronomic zone with the banquet zone. Room with tall windows, naturally illuminated. Conference room, situated in a quiet part of the hotel, perfect for running workshops or smaller trainings or business meetings. Room with tall windows, naturally illuminated. Conference room, situated in a quiet part of the hotel, perfect for running workshops or smaller trainings or business meetings. Possibility to go to the adjacent Ebony Room through the transition with a door connecting both rooms creates a possibility to organise small parties with connection of gastronomic zone with the banquet zone. Room with tall windows, naturally illuminated. Conference room, situated in a quiet part of the hotel, perfect for running workshops or smaller trainings or business meetings. Possibility to go to the adjacent Indigo Room through the transition with a door connecting both rooms creates a possibility to organise small parties with connection of gastronomic zone with the banquet zone. Room with tall windows, naturally illuminated. Functionality of conference rooms allows for the use of a range of technical solutions, well-thought interior as well as enjoy comfort. An appropriate conference or banquet room is one of the bases to achieve success. This is the place where important business meetings, formal galas, events, which often shape the image of the company, take place. It is extremely important that space in which the important meetings take place is prepared at the topmost level with professional equipment and distinctive vibe. The supplementation of conference rooms is Foyer, surrounding the Fuchsia Room, which thanks to connection with the room creates space with the area of 1000m2. An additional asset of Foyer is the possibility to bring a car or large equipment through the openable window to the Fuchsia Room. Entrances to Foyer are located at the side of the spacious hall which can be used as an additional Foyer, giving possibilities to arrange small exhibitions. Arche Hotel Krakowska is a great base for indoor integrational activities and organisation of additional events and large events. A well planned and organised event is kept in the participants' memory for a long time and, most of all, sheds light on the company's image. We will organise a gala, supper connected with integrational attractions or unique shows and entertainment elements, with our full involvement, from preparation of the offer, through coordination, to closing the venture. in response to your expectations.